Help spread the word to the public you serve! ICC and the National Storm Shelter Association (NSSA) are offering a free online course to provide consumers with the information necessary to make an informed decision about installing a storm shelter in their homes. The course also reviews the types of weather hazards that can affect consumer safety, how a storm shelter mitigates the risk, and the significant features of storm shelters, including the initial investment. 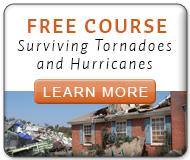 Share this information on your jurisdiction website by using an eBadge and linking to the Surviving Tornadoes and Hurricanes free online course. View more training, including certification exam study and premier online code training courses on ICC’s Campus Online.